All systems both Passive & Active are installed according to ASTM E-2121 Standards for environmental site remediation of VOC's. We meet MDEQ standards for installation of our systems. 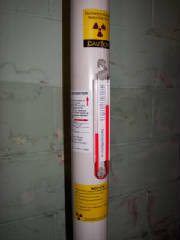 Explosion Proof Soil Depressurization Systems pull VOC's out from underneath building concrete slabs. Environmental and petroleum companies seeking help with volatile organic compounds (VOC's) remediation can use our subcontracting services. We can help you by installing active soil depressurization systems. We customize fans, piping and monitoring systems to meet your performance specifications. We provide installations and consulting throughout the U.S.
*Site Plan & Foundation, Elevation and Floor Plans of building. *Type of subslab volatile compound to be remediated and levels measured, if available. *Specifications for the soil remediation project from the owner(s), if specified. *Specifications by local or state regulatory agencies that you are required to meet, if any,i.e.,M.D.E.Q., A.S.T.M. etc. *Pollution permits may be required for these systems and these should be obtained by the owners prior to any installations, if necessary. *Your complete contact information so that we can schedule reply to Requests for Proposals.